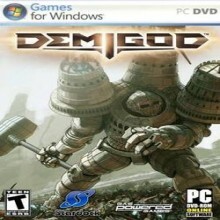 Gas Powered Games has unleashed a powerful assortment of both heroes and anti-heroes in their latest action-packed release for PC, “Demigod”. For those of you looking for the newest RTS or something to hold you over until “Diablo III” is released, look no farther. Thanks to Gas Powered Games, we now have the ever so awesome “Demigod” at our fingertips. This is essentially a fast-paced, online-focused hybrid of the RTS genre and the hack’n slash RPG genre. While this game definitely has it’s flaws, there’s a lot of fun to be had here. Be you a chosen one of the light or a follower of darkness, prepare for the fight of a lifetime in “Demigod”. For an RTS, this game is beautiful. Particle effects, high quality textures, fancy special effects; it’s all there. The best part: It runs on a very wide range of systems. It doesn’t take an extreme gaming rig to max this game out while still maintaining a solid framerate. On the same subject, the battlegrounds, while generally designed to be the same thing, feel incredibly different from one another just because of the scenic differences. The demigods are even more varied, each with a very distinct (and fitting) style. On the other side, the sound quality is extremely repetitious and generic. There’s not much to be found outside of a bunch of drum lines that never sound much different, regardless of character or battleground choices. Throw in a bunch of fairly bad voice actors that repeat the same phrases a bit too often and you have a very mediocre mark for the sound category. The user interface is extremely simple to navigate, which is an obvious part of a very intentionally simplified design. After you’ve messed with the option menu and create your profile, you’re pretty much ready for business. Join or host an online match or play an offline match, pick your Demigod and prepare for action. The setup is literally that easy, although there are plenty of options available for players who prefer slower-paced or even ridiculously fast-paced matches, as well as options to just make the match easy and completely focused on insanely fast-paced combat-oriented matches. After you’ve chosen one of the eight Demigods and the match begins, things are deceivingly simple to learn. While there’s no tutorial and the game seems much more complex than it really is, there’s honestly not all that much to learn. Within’ a handful of matches, an average player should be quite familiar with everything the game has to offer. The controls are extremely simple and if you’re fast and precise enough, you can play the entire game using literally the mouse to move and the right and left mouse buttons for everything else. The scroll wheel may be useful from time to time just to zoom in or out when needed, but otherwise the controls are so dumbed down that an original Nintendo controller wouldn’t have any trouble playing the game. There’s not as much of a need for precision as other RTS titles and the game moves at such a pace that you don’t need to move at an extreme pace to come out on top. As for the gameplay itself, there’s a bunch of upgrading things and destroying things. To elaborate, you can buy artifacts for seemingly overpowered benefits, upgrade your army, purchase Demigod-specific items, purchase basic armor and spend skill points to level up your Demigod’s abilities. To purchase Demigod upgrades, you simply must kill opponents or be in the vicinity when an ally kills another opponent. Killing the opponents yourself nets the most experience, but it’s not very difficult to level up by any means. New abilities are unlocked as you go, with the final tier presented at level 15 and the max level being 20. It’s possible to max out a good majority of almost every Demigod’s skills, although a select few require a bit more strategy while choosing how to level up. Purchasing upgrades for your army and equipment is done with a classic currency: gold. To earn gold, you simply wait for the slow, but automatic tally to climb up to the necessary amount or you kill a lot of opposing forces. Early on, money may seem tight, but as the match goes on, it’s pretty simple to buy just about anything you want. The final component of the upgrade system is the “Faith Point” mechanic. As you win matches, you’ll earn said “Faith Points”. Using those points and a small amount of gold, you can purchase a single permanent bonus at the beginning of a match. The permanent bonuses range from the most basic +400 health add-on to a 15% movement bonus, as well as very powerful usable skills. It all boils down to this: “Demigod” isn’t really about micromanagement, rather it’s one big upgrade festival, which isn’t a bad thing and is also a major part of why it stands out as a deceptively unique game. Instead of building structure, waiting for new units and planning all of your attacks far in advance, players simply upgrade things however they want and rush to duke it out. The game uses a respawn system that essentially allows all Demigods to be invincible, so even the worst players are able to stick around long enough to at least stand a fighting cance. But if you can’t really die forever, how do the matches end? Simple: Citadels. Each Demigod fights for a cause, either siding with the light or dark team. Each of those two teams has a citadel and if that citadel is destroyed, it’s game over. The winner is the team who destroyed the citadel, of course, but getting to the citadel can prove to be a very difficult task on some maps, especially with something crazy like a 5v5 team setup. Things get very chaotic and while it can be confusing, it’s an experience only found in “Demigod”. And to clarify something about this crazy jumble of madness, there’s absolutely no story. It’s more like “Tekken” in a certain sense. There’s a tournament held by the Gods to choose which Demigod is going to ascend to their ranks. You play as one of those Demigods and your goal is to become the next God. It’s as simple as that. It’s very shallow and serves as nothing more than a purpose to fight and truth be told, that’s all this game really needs. The single player component is good enough to hold it’s own for quite some time, but online play gives this game enough replay value to survive for many a year with proper updates and a few small balance fixes. Thankfully, the online component is fantastic now that everything has been fixed. Because of that, I think this game deserves a second chance from the critics who already reviewed it based on launch day problems. The majority of the problems were fixed within’ the first week and if that doesn’t say something, I don’t know what else will. Seriously, how many other developers of smaller games like this care about their game that much? Think about that! Overall, “Demigod” is one hell of a game with almost too much replay value and massive amounts of potential for expanded content in the form of extra maps, more characters and even new modes. Good job, guys! -Visuals are as good as it gets for an RTS. -Each of the 8 Demigods are extremely unique. -Aside from a few small issues, this is a very well-balanced game. -Can be ran on most low end machines without sacrificing much fluidity. -Single player is almost as fun as online multiplayer. -Developers genuinely care about their fans and the quality of the game. -Very simple control scheme; could easily be ported to any console. -Soundtrack is very bland and overly repetitious, albeit fitting for the setting. -Voice acting is pretty bad. -Impulse is a forced installation, as far as I can tell. NOTE: I am in no way badmouthing the Impulse design, but the simple fact of the matter is that some people just prefer to play games without being bound to anything else on the side! I highly recommend this game to just about anyone out there who thinks that this game sounds even remotely entertaining. It’s a fantastic buy and it’s sure to be worth the money for any devoted player.